Laoconnection.com: What Did the Laos-Cambodia Security Meeting Achieve? Laos and Cambodia, two neighboring members of the Association of Southeast Asian Nations, share a 540 kilometer, partly demarcated land border. The two have tried to boost their ties in recent years, with the focus being on areas in the economic and people-to-people realms. But outstanding differences, particularly in terms of their undemarcated border, have at times threatened to upset ties. Last year, simmering border tensions yet again threatened to boil over into potential conflict and the situation was only deescalated following intervention by high-level officials. Both sides have nonetheless continued to hold exchanges to better manage their border issues, which include not only managing potential escalation and differences over border surveys and demarcation, but also tackling cross-border crimes such as drug trafficking. Laos and Cambodia are also trying to make progress in areas like legal border crossings and facilitating communication between border facilities. One of the mechanisms through which these issues are discussed is an annual bilateral meeting between the Ministry of Public Security of Laos and the Ministry of Interior of Cambodia. Last year’s iteration of the meeting occurred amid uncertainty given the border tensions between the two sides. Both sides unsurprisingly sought to play down the stand-offs publicly and focus instead on areas where progress was being made, such as information exchange on cross-border crimes. These developments took place within a broader context of ongoing transition for both countries, which reinforced the importance of managing ties with neighboring states. Laos’ new leadership took office in January 2016 following the quinquennial Party Congress and Cambodia’s ruling Cambodian People’s Party (CPP) under Hun Sen held commune elections in 2017 and will see general elections in 2018. On January 17, another iteration of the annual bilateral security meeting was held in the Lao capital of Vientiane. As with last year, the meeting was co-chaired by Lao Minister of Public Security Major General Somkeo Silavong and Cambodian Interior Minister Sar Kheng. 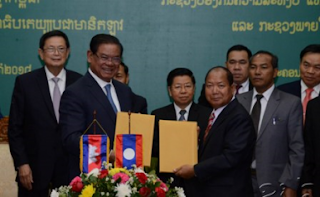 According to Lao News Agency, during the meeting, both sides took stock of progress they had made over the past year, including implementing a memorandum of understanding the two ministries had inked in 2017 and collaboration in areas like managing peace and security, drug inspection and control, anti-human trafficking efforts, immigration, and facilitating border exchanges. Both sides reportedly noted that they were satisfied with the implementation of the MOU on drug inspection and control cooperation by both sides at the central and provincial levels. Unsurprisingly, no direct public mention was made of the more sensitive issue of border tensions. The meeting also saw the inking of an annual memorandum of understanding on cooperation between the two ministries for 2018. As with the agreement from last year, no specifics were publicly revealed regarding the contents of either what was discussed or included.